The New Year came with baggage from the old for thousands of federal employees caught in the middle of a budget tug-of-war between Congress and the White House that has led to a partial government shutdown. 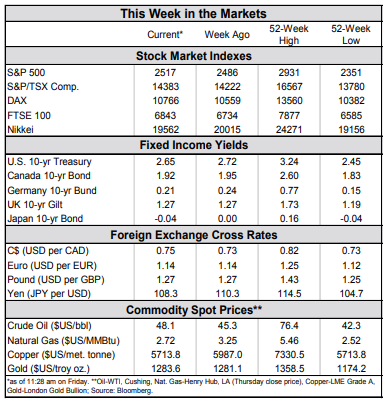 The volatility in stock markets continued early in the week as a slew of weaker-than-expected economic data and signs of a slowing China roused investor concerns that global growth may be slowing faster than expected. 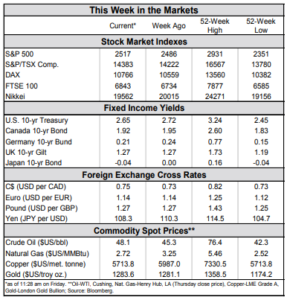 Fortunately, a strong payrolls tally lifted investors’ spirits by week’s end. Employment rose 312k and the unemployment rate edged up to 3.9% as more people joined the workforce. Hourly earnings growth also topped 3% (year-on-year) for a third consecutive month. Happy New… whatever. 2019 kicked off with a fizzle as a partial U.S. government shutdown that began in the old year limped into the new. President Trump and Congress are at a stalemate over discretionary funding for 25% of the Federal government, and a border wall with Mexico. The standoff meant a not-so-happy start to the New Year for over 800,000 federal employees who have been furloughed, or if considered “essential”, had to work without pay. 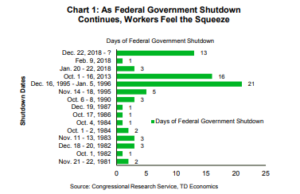 Set to enter its third week, the shutdown is expected to negatively impact consumer spending and business activity. Assuming it ends soon, it is projected to lower first quarter GDP growth by 0.1 percentage points. Once resolved, federal employees will receive back pay, (though workers on contract will not), and this should boost economic activity in the second quarter. The question that remains is how long it will last. The longest government shutdown was for 21 days in 1995 (Chart 1), but workers and businesses who depend on their spending, are hopeful that such a scenario will not be repeated. The stock market also rang in the New Year noticeably lower. 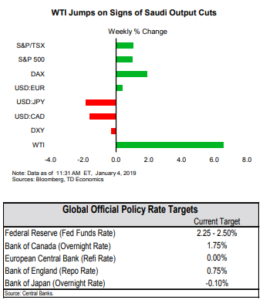 Sentiment had been dragged down by a confluence of factors ranging from slowing global growth and uncertainty over the Fed’s policy path to simmering trade tensions between the U.S. and China. A weaker-than-expected reading for December’s ISM manufacturing index on top of an outright contraction in China’s manufacturing activity, further fueled fears through the middle of the week. Though still technically in growth territory, the U.S. ISM index posted the slowest pace of expansion since November 2016, reflecting concerns of less robust demand and trade worries. The Trump administration has negotiated truces with multiple trading partners, however, many of these are set to expire in short order. Unless a long-term agreement can be reached, businesses may face renewed trade uncertainty as the year unfolds. By the end of the week, a nod to “patience” by Fed Chair Powell and a strong December jobs report helped pull equity markets back into positive territory. Non-farm payrolls exceeded expectations, adding 312K jobs in December. This resulted in 99 straight months of expanding payrolls – the longest stretch on record. Even the uptick in the unemployment rate to 3.9% resulted from a labor force rising participation rate. 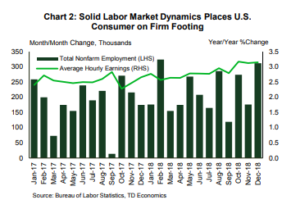 Such dynamics suggest that even amid the tightest labor market in decades, the U.S. economy is still able to pull workers off the sideline and into the job mix. Wages also surprised to the upside, growing by 3.2% year-on-year (Chart 2) – the best full-year gain since 2008. The employment data should serve to calm concerns that the American economy is quickly running out of steam. While growth in 2019 is projected to be lower (see forecast), we still expect it to remain above the economy’s trend pace. All in all, government showdowns aside, consumers remain on firm footing, supported by the most favorable labor market in decades.